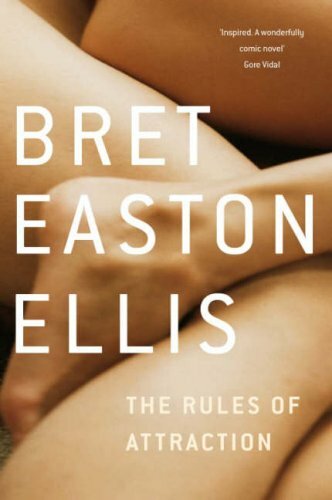 Knowledge, Postmodernity, and Bisexual Love Triangles: Bret Easton Ellis’ The Rules of Attraction – Angel Daniel Matos, Ph.D.
“What in the hell does that mean?” I ask. What does it mean to know someone? Friendship, kinship, romance–all of these relationships are based not on blood lineage or genetics, but on the promise of knowledge. What I mean by this is that these relationships are typically forged through experience and through sharing: two or more people have decided to link their hopes, fears, emotions, time, bodies, and space in an effort to stave off solitude, emptiness, and/or ennui. But what happens to relationships if we were to focus on the fact that at the end of the day, it is impossible to truly know someone in their entirety? Through the exploration of the psyche of three characters living a life debauchery, hedonism, and at times, nihilism, Bret Easton Ellis’ The Rules of Attraction exemplifies the futility of trying to know someone. The novel highlights how people are prone to lying, creating an inauthentic image of the self, and misreading the actions of behaviors of those who surround them in an effort to create meaningful connections. This novel oozes postmodernism. When first reading the book, I thought I had a misprint in my hand due to the fact that the novel begins in the following fashion: “and it’s a story that might bore you but you don’t have to listen, she told me, because she always knew it was going to be like that […]” (13). After doing some quick research online, I found out that the novel was deliberately written this way in en effort to wedge the reader right in the middle of the action. The novel also ends in an incomplete sentence, further eradicating any sense of finality in the novel. Another trait that characterizes the novel as postmodern is its historical rootlessness. Although we are given bits and pieces of the characters’ past through their interactions with friends and family members, we are not given a full back story for most of the characters. We don’t know who the characters were, we can’t tell who the characters are (due to the novel’s ambiguity and contradictory accounts), and by the end of the novel, we can’t even begin to estimate what will happen to these characters–further adding fuel to the novel’s theme of the elusive nature of knowledge. Because of the reasons above, it is quite difficult for me to provide an accurate summary of the novel. The three main characters of The Rules of Attraction–a novel that is narrated from multiple first-person perspectives–are Sean Bateman (a young man from a wealthy family who heavily abuses drugs and alcohol, who is ostensibly bisexual, and who is prone to self-loathing and suicidal tendencies), Lauren Hynde (a depressed and overly emotional artist/poet who sleeps with many men in an effort to forget her ex-boyfriend), and Paul Denton (a smart, libidinous, self-centered, and overly self-aware bisexual man). They all go to a fictional liberal arts college in the East Coast known as Camden, and the novel heavily implies that they are involved in a love triangle. Paul used to date Lauren before the novel takes place, and it can be interpreted that Sean sustains an active sexual relationship with Paul and Lauren (even though he solely confesses his love for the latter). The passage above illustrates many key features of the novel’s content. It first and foremost shows that there are certain things that people never talk about even though they think them. Interestingly, Sean comments on how Lauren never talks about their sexual relationship, which possibly mirrors his own inability to talk about the (possible) sexual relationship that he has with Paul. Furthermore, the passage depicts how Sean makes assumptions and interpretations of Lauren’s behavior, going as far as to deduce that the reason she doesn’t talk about their sexual relationship is because she is so deeply satisfied with it. However, we later on discover that Lauren doesn’t feel too enthusiastic about her sexual relationship with Sean, and she even fakes her orgasms most of the time. Paul and Sean’s relationship was one of the most intriguing aspects of this novel, especially due to the dual interpretation that it invokes. On one hand, if we approach this relationship as a figment of Paul’s imagination, then it can be said that it reflects the theme of desire and dangers of living vicariously through the imagination. On the other hand, if we approach the sexual relationship as real, the focus then becomes Sean’s repression and inability to accept and know himself (thus making truly impossible to know anyone or anything). Trying to choose a side is difficult and impossible. At times, I find myself leaning with Paul due to the fact that Sean seems to be deliberately malicious and duplicitous, but on the other hand, I’m also aware that Paul has an ability to change his self-depiction to suit the tastes of those he tries to seduce. For instance, when he first meets Sean, he pretends to have failed a couple of classes in an effort to seem more accessible, especially since Sean is notoriously known for having no interest in academic affairs. Is it possible that Paul’s narrative perspective is deliberately crafted in a way that makes us as readers more sympathetic to him? What makes this novel fun and great is precisely its ambiguity, and its attempt to replicate our approach to the people around us. We can make estimations of why people are the way they are, why they behave a certain way, why they engage in certain activities, but all in all, we can never be certain. Our knowledge of people is not truth. Our knowledge of people is limited to what they divulge to us, and even then these revelations can be twisted, fabricated, or misinterpreted. Attempting to know the characters in this novel makes us no different from Paul during the narrative’s conclusion, who chases after Sean’s motorcycle as it rides away in the horizon–aware of the fact that he would never catch it. Perhaps Ellis is parodying us as readers, who expect to understand the characters by the time we reach the final page. Yet, as a cruel and ironic joke, the final chapter is incomplete–leaving us exactly where we began. I guess Sean Bateman was right… we’re not ever gonna know anyone. Easton Ellis, Bret. The Rules of Attraction. New York: Vintage Contemporary Editions, 1998. Print (Paperback).